The whole world starts preparing weeks and months ago to celebrate International Day of yoga. The enthusiasm of yoga practitioners is at its peak on this day. Around 180 countries indulge in yoga practice on International Day of yoga. People all over the world shares their practice through social media platforms. It becomes the center of attraction for all international news channels. Yoga on this day, turns into an occasion for the humanity to unite and share a common gratitude for yoga. It represents immensely growing love and appreciation that people have towards yoga. India, where yoga was born, feels proud to see how beautifully the whole world have adapted yoga practice. For centuries, yoga enthusiasts from another country, have kept coming back to India to learn more from their gurus. After gaining enough knowledge they become ready to teach in their own country. This cycle of transferring yoga knowledge has been followed for several centuries. Through the efforts of all these yoga devotees, yoga has established an international recognition. Leaving behind the times when yoga was known to only a few. Modi proposed 21st June to be recognized as International Day of Yoga. After observing its global appeal, United Nations agreed to Modi’s proposal. On 11th December 2014, the declaration was made public to recognize 21st June as International Day of Yoga. The following year, the whole world celebrated first International Yoga Day on 21st June 2015. 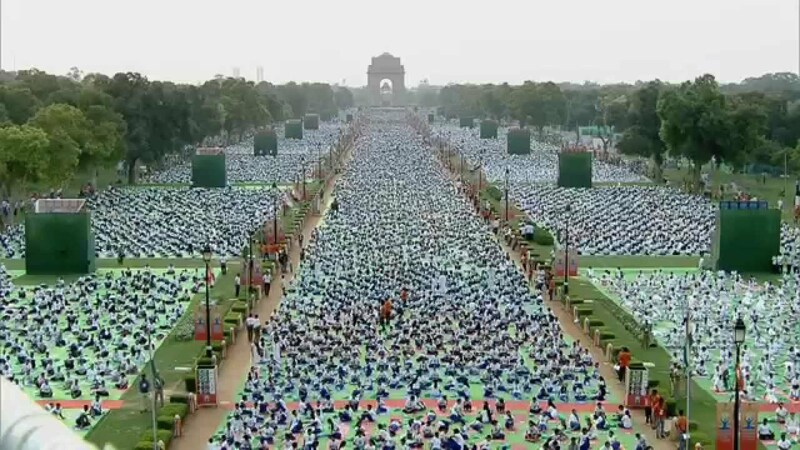 People all over the world gathered in huge number and performed yoga including Asana and Pranayama. 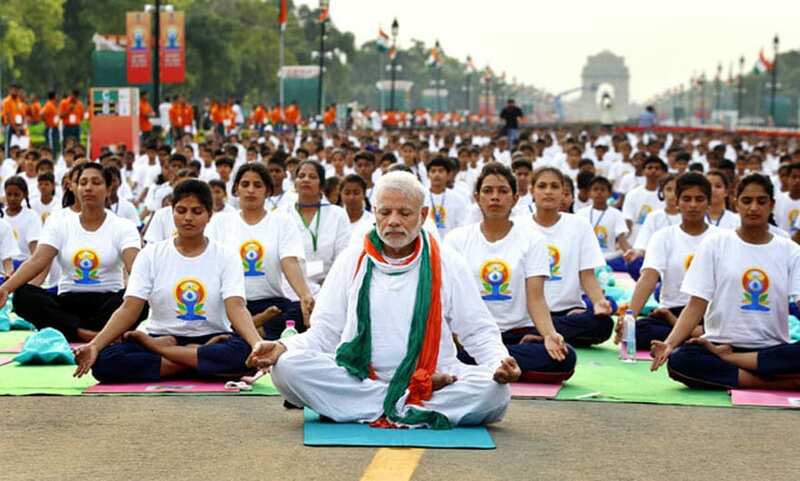 Narendra Modi himself participated in 1st Yoga International day along with approximately 35,000 people at Rajpath. The event also had a large number of International dignitaries from 84 nations. To prepare for this day, a yoga protocol was announced a few months before the International Day of Yoga. It included 21 yoga asanas that lasted for 35 minutes’ practice. Training was made available for everyone willing to participate in the event. Yoga is believed to be created by an Indian deity known as Lord Shiva. Ancient yogic texts describe that Lord Shiva transferred the knowledge of yoga to his female devotee upon her request. And since then it has been known to spread gradually until now. Yoga practices were intense in ancient times, yogis used to spend months and years meditating in the caves. The level of mastering yoga asana was beyond what it is today. As the world changed, considering the lifestyle and body of the new age man, ‘Modern Yoga’ was created. Today, India is proud of spreading yoga throughout the world. But it could not have been possible without Yoga legends such as Swami Sivananda, Tirumalai Krishnamacharya, K. Pattabhi Jois, B.K.S Iyengar and some others. The exploration of yoga from East to West was made possible with the efforts of these yoga gurus. As more people heard about yoga, the more they wish to learn. New yogis were created under the guidance of the ancient yogis. The transfer of knowledge is still on the run and will be there till the end of time. The process of yoga becoming popular in the west was quite slow and gradual. Very few Americans were first driven by the idea of Yoga. They came to India seeking practical and theoretical knowledge of yoga. Learned it and took the knowledge back with them and started their own yoga studios. As the time went by, more and more foreigners found themselves attracted to yoga. They took the same path and went back and forth to their country and India learning and teaching at the same time. Since the practice of yoga took years to master. During the journey of yoga, many yoga devotees unknowingly inspired more people to travel to India to learn yoga. For those seeking to learn yoga as a profession, it becomes more reasonable to find their own guru. Indian yoga gurus were always happy to see more and more people coming to them to learn yoga. They were happy to know that people from all corners of the world were recognizing the potential of yoga. Then came the evolution of the internet and yoga gained popularity like never before. The benefits of yoga became a major reason for more and more people to opt for it. The more modern the man became the more he separated from nature. Stress became a major issue of hectic lifestyle. Chronic and life-threatening ailments started to increase in number day by day. The therapeutic qualities of yoga made it more desirable to people. Not to only improve their condition but also to prevent any impending health issue. No doubt Yoga became a blessing for the modern man struggling with everyday life. Keep practicing yoga and continue to make yourself a better person. Happy International Day of Yoga to everyone.